Philippines: Indonesia’s Gojek partners with local fintech Coins.ph. MANILA, Philippines — Gojek, Indonesia’s on-demand multi-service platform, has partnered with Philippine fintech company Coins.ph. As part of this collaboration, Gojek is making a substantial acquisition of shares to support Coins.ph in its rapid growth to meet the financial needs of all Filipinos. Gojek’s payments platform and the leading digital payments service in Indonesia Go-Pay and Coins.ph will work together to make it easier for Filipinos to process their payment needs. Together, the two companies will work to enhance use cases and expand access to cashless payments and banking services, deepening financial inclusion in the Philippines, officials said. Coins.ph helps its customers to easily access a variety of financial services – including mobile airtime, remittances, and bill payments – on their mobile phone. It has grown its customer base to over five million in less than five years, processing over six million transactions per month as of December 2018. 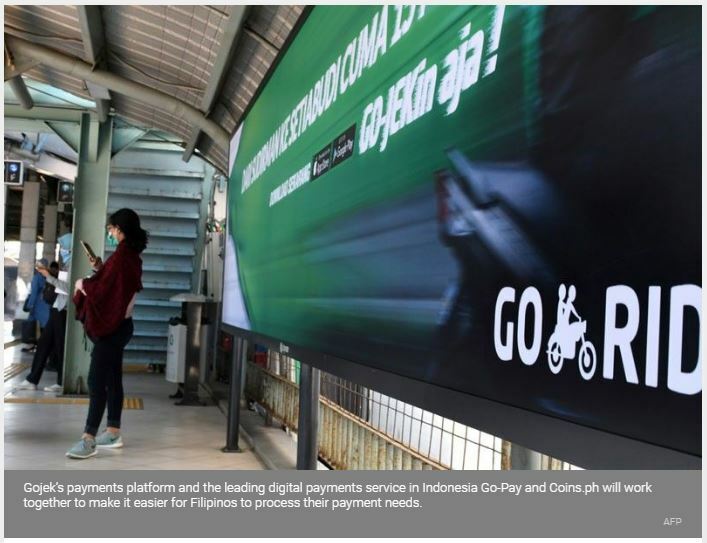 Similarly, in Indonesia, Go-Pay has successfully contributed to the shift from cash transaction to cashless transaction habits both within and outside the Gojek ecosystem. More than 50 percent of transactions within the Gojek ecosystem are done cashless through Go-Pay. By partnering with financial institutions, it also facilitates access for the unbanked to financial products and services. Coins.ph founder and CEO Ron Hose said the company is proud to showcase the success of Philippine startups. In just a few years, our team has been able to build a scalable service extending financial services to millions of Filipinos,” Hose said. Hose said that Coins.ph and Gojek share the vision of empowering their customers by giving them lower-cost and more convenient access to services. Aldi Haryopratomo, CEO of Go-Pay said there is huge potential for Go-Pay to bring greater access to crucial financial services in the Philippines by combining its technological expertise, scalability and experience in Indonesia with Coins.ph’s deep local knowledge and strong customer loyalty. Officials said the move would help meet the government’s aspiration to increase digital transactions to 20 percent by 2020 from one percent in 2018. “We are excited to work with Coins.ph, a company that shares our ethos of empowering communities by bringing more people into the digital economy. Consumer transaction behaviour in Indonesia and Philippine share many similarities, and together with Coins.ph, we hope to have similar success in accelerating cashless payments in the Philippines,” Haryopratomo said. Gojek founder and CEO Nadiem Makarim said that with the second largest population and a strong domestic economy, the Philippines is one of the most exciting markets in Southeast Asia.